I have a Masters in Mathematics and another Masters in Education. I am an experienced qualified teacher with thorough understanding of mathematics concepts and a strong ability to coach students in the subject. I have provided one-on-one as well as small group tutoring to students. I have successfully lectured intelligent students who need to finish their course syllabus and at the same time I have guided other students too who might be lagging behind in the subject due to one reason or the other. I discuss in length the whole topic first and then try to ascertain students understanding level on the topic. Then I try to prepare a personalized strategy for each student based on his/her grasping ability. This usually involves teaching those topics again, giving home assignments to students, periodically conducting unit tests and assessing them. I undertake quiz sessions to keep a track on student's progress. I make sure that my class environment turns to be interesting for the students by maintaining a friendly approach. I have a good knowledge of mathematical problem solving shortcuts which I try to pass on to my students and I have found that this really interests even the struggling students and they feel more confident and develop flair for the subject eventually. I had Hindi as a subject from K 1-12. I did my Bachelors degree in Arts with Hindi as a subject from India. My mother tongue is Hindi. I am fluent in Reading, Writing and Speaking in Hindi. I have 22.5 credits in Hindi in my Undergraduate degree. I hold Masters degree in Science with specialization in Mathematics. I hold another Masters degree in Philosophy in Mathematics. I have been teaching Mathematics at Middle and High school levels for last 10 years at High school in India. I am quite proficient in mathematics with excellent problem solving skills and teaching aptitude. I have tutored college students even for Mathematics as a subject in their curriculum. I have coached students preparing for entrance examinations for prestigious colleges in India. I have scored 6 credits in Advance Discrete mathematics in my M.S. I hold a Master's degree in Science with specialization in Mathematics. I hold another Master's degree in Philosophy in Mathematics. I have been teaching Mathematics at middle and high school levels for last 10 years at high school in India. I am quite proficient in mathematics with excellent problem solving skills and teaching aptitude. I have tutored college students even for Mathematics as a subject in their curriculum. I have coached students preparing for entrance examinations for prestigious colleges in India. I have got A+ grade in Discrete Maths and Finite Algebra,Number theory. I hold a Master of Science degree in Mathematics and an another Master of Philosophy Degree in Mathematics. I have undertaken coursework on Linear Algebra in the curriculum and scored well. I have successfully taught middle and high school students and college students for Algebra 1, 2 and Linear Algebra. In my M.sc degree I studied a computer science topic on logic. I have taught students for Bachelors in Computer Applications (B.CA) degree. It's one of my favorite topic in which I feel am quite comfortable teaching the students. I have Master of Education degree with Special Education. I have more than 5 years teaching experience in teaching with special needs kids. I hold Masters degree in Science with specialization in Mathematics. I hold another Masters degree in Philosophy in Mathematics. I have been teaching Mathematics at Middle and High school levels for last 10 years at High school in India. I am quite proficient in mathematics with excellent problem solving skills and teaching aptitude. I have tutored college students even for Mathematics as a subject in their curriculum. I have coached students preparing for entrance examinations for prestigious colleges in India. I hold Masters degree in Science with specialization in Mathematics. I hold another Masters degree in Philosophy in Mathematics. I have been teaching Mathematics at Middle and High school levels for last 10 years at High school in India. I am quite proficient in mathematics with excellent problem solving skills and teaching aptitude. I have tutored college students even for Mathematics as a subject in their curriculum. I have coached students preparing for entrance examinations for prestigious colleges in India. I am graduate in English and post graduate degree in Maths. I have 30+credits score in Mathematics. Anjali is tutoring my son in Algebra I. She's been extremely helpful and is very patient with him. She is really helping my son to build up his skills and gain more confidence. She is extremely knowledgeable, very patient, and works great with my son. We're so pleased. Anjali is an excellent tutor! She is very thorough and won’t move forward until my daughter completely understands the concepts. My daughter’s confidence in math is getting better. My son went from being confused to getting a 95 on his math test later that afternoon. We will be calling her again. Anjali helped me in preparation to take Praxis 5003. She was very knowledgeable, patient, and kind. She also made sure that I understood, what she was teaching me, and that she was satisfied that I understood it. 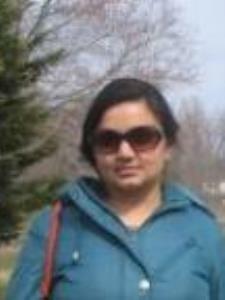 I would not hesitate to hire Anjali again for tutoring services..
Anjali helped my 8th grader with Geometry. When my daughter started with Anjali Geometry was not one of her favorite subjects. But after few weeks of tutoring her grades improved tremendously. She got accolades from her teacher too for turning her grades around. Anjali helped to move Alex up the learning curve and understand many of the type problems he'll need to solve during the ACT Math Section. Perhaps because the session was held at the Library, Anjali was very soft spoken and at times difficult to hear. Next steps for Alex: He will practice by taking multiple Practice Tests. I would definitely recommend Anjali as a Tutor.